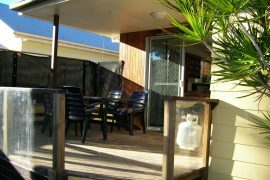 Wynnum Manly Hideaway offers five comfortable homes for families and groups in need of temporary or relocation accommodation in Brisbane. All our family-friendly homes are ideal for those who have relocated to Brisbane but are still in the process of moving in to their new home. We have accommodated relocating families who were still in the process of deciding or moving into their new and permanent home in Brisbane. 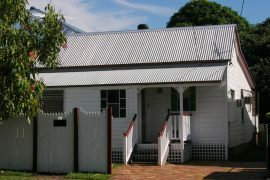 Our self-contained homes provide relocating families comfortable and secure accommodations while they are still exploring the Brisbane community, visiting the schools where their kids will attend, discerning which suburb best fits their family’s needs and waiting for all their belongings to arrive. We can extend bookings until your family has moved into your permanent home. While each of our properties have their own unique charm, all have been designed to keep you and your whole family feel truly at home, even for a short while. Choose from any of our spacious homes that can accommodate between 8 to 12 persons, featuring 3 to 5 private bedrooms and clean bathrooms, some en suite. Comfortable beds and bunks, lounge chairs and even outdoor dining are available for your exclusive use. What makes our homes truly special is they were designed for your pets’ comfort as well! Four of our homes are pet-friendly, so you won’t have to worry about where they should stay while your stuff is still in transit. All our fully-furnished homes will make your temporary stay not only comfortable but also convenient and worry-free. Our homes include efficient and modern equipment that allow you to spend more time with your family or focus on securing your new home. Prepare your family’s favourite dishes in your own kitchen complete with full-size refrigerator, oven and stovetop. Save time doing time-consuming chores with our dishwasher, laundry and ironing facilities. 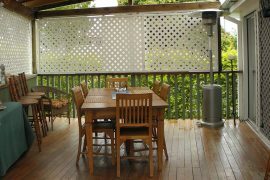 Our homes also include a BBQ grill to satisfy your craving for BBQ. Have a baby or toddler in tow? We provide a cot and high chair upon request to make things easier for you. 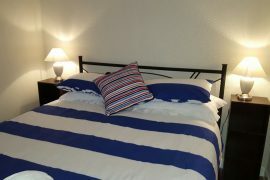 Linens (except for the cot), pillows and towels are all provided for your convenience. We take our guests’ safety seriously, no matter how long or how short they are staying with us. For this reason, we have designed our homes with security features such as extra-high carports, key lock boxes and off-street parking for our guests’ peace of mind. Our four pet-friendly homes have fully-fenced backyards where you grill BBQ while watching your kids and pets play in complete safety. 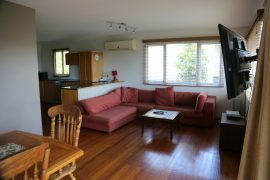 Make the most of your stay in the Bayside! Our five homes are located in Wynnum and Manly, sister suburbs which are teeming with family-friendly activities that can make your temporary stay special! Take your pick from family-friendly amenities such as beaches, kiddie pools and playgrounds, seafood restaurants along the esplanade, pet-friendly cafes and parks, and water fun activities such as cruises, fishing charters, kayaking and sailing! Our homes are within walking distance to these exciting amenities and public transport is highly accessible too, so you have no excuse not to make the most of your short stay in the Brisbane bayside!